Angular NgModel Directive Example Tutorial is the today’s leading topic. The ng-model directive binds the value of HTML controls (input, select, textarea) to application data. Using the two-way binding, we can display a data property as well as an update that property when the user makes changes. We can merely achieve it in the component element as well as HTML element both. The two-way binding uses the syntax as [()] or bind- keyword. The two-way binding uses the syntax of property binding and event binding together. Property binding uses the syntax as bracket  or bind- and event binding uses the syntax as the parenthesis () or on- and these bindings are considered as one-way binding. Two-way binding works in both directions are setting the value and fetching the value. The two-way binding uses a specific name pattern. Okay, let us install Angular using Angular CLI. Type the following command to install Angular. 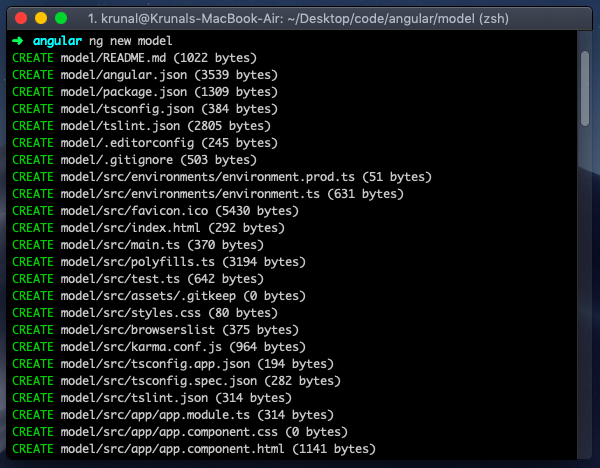 Now, generate the Angular project using the following command. Now, import the FormsModule inside the app.module.ts file. Inside src >> app folder, create one file called AppData.ts and add the following code. So, here we have taken one property called name which is the type of String. Now, import this model file inside the app.component.ts file. Okay, so to work two-way data binding correctly with ngModel, we need to write the following code inside the app.component.html file. Added a name attribute to the input tag. It is a requirement when using [(ngModel)] in combination with a form. You can see that using NgModel directive, and we can able to do the two-way data binding. If we take a look at the source code, we’ll notice that ngModel comes with a property binding. The property binding [ngModel] takes care of updating the underlying input DOM element. Angular allows the shorthand syntax using [()], also called “Banana in a box”. So after all, it’s an implementation detail of ngModel that enables two-way data binding. Finally, Angular NgModel Directive Example Tutorial is over.